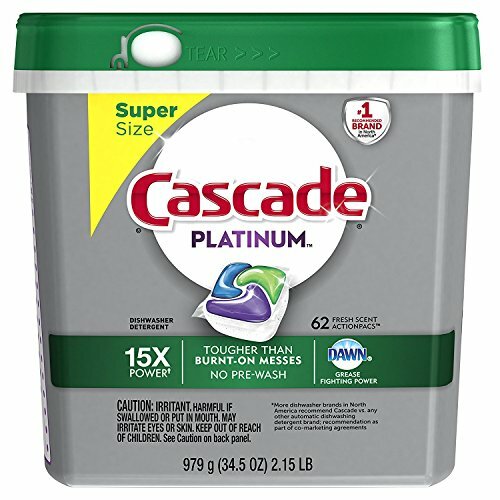 Cascade Platinum ActionPacs clean burnt-on messes in just one wash, with no pre-wash needed. Premium tough food cleaning powers away burnt-on foods, while built-in rinse aid action and the grease-fighting power of Dawn make your dishes dazzle. They're our best clean for sparkling silverware and even your dishwasher. Plus, Cascade Platinum dishwasher detergent is formulated to help prevent hard-water filming-keeping your machine looking fresh and clean. Simply pop in an Action Pac and reveal a Platinum sparkle. If you have any questions about this product by Cascade j, contact us by completing and submitting the form below. If you are looking for a specif part number, please include it with your message.